Couples looking for special photos during their pregnancy should hire a professional photographer. Documenting this time before the arrival of your baby is a great way to create memorable maternity photos. In this photo the dad to be wore a classic tuxedo and the expecting mom wore a white dress with off the shoulder sleeves. The best part about this photo was their dog in the picture. She was even dressed up with a cute outfit. Hair and makeup: Getting your hair and makeup done professionally Is a great way to look and feel great during your photo session. Maternity dress: Treat yourself to a beautiful maternity dress that is tight and stretchy to show off your belly. We also recommend a maternity wrap. Location: Choosing the perfect location can be challenging. Make sure to ask a professional for help. Time: Knowing when the right time of day to take your photographs is important. If you are looking for sunset photos make sure to know when that is. We recommend not shooting during the middle part of the day when the sun is highest and most intense. Have fun and relax: This might be the most important advice we have to offer. When you are having fun and can relax your photos will truly shine and show your personality. This is when we get the most authentic photos. 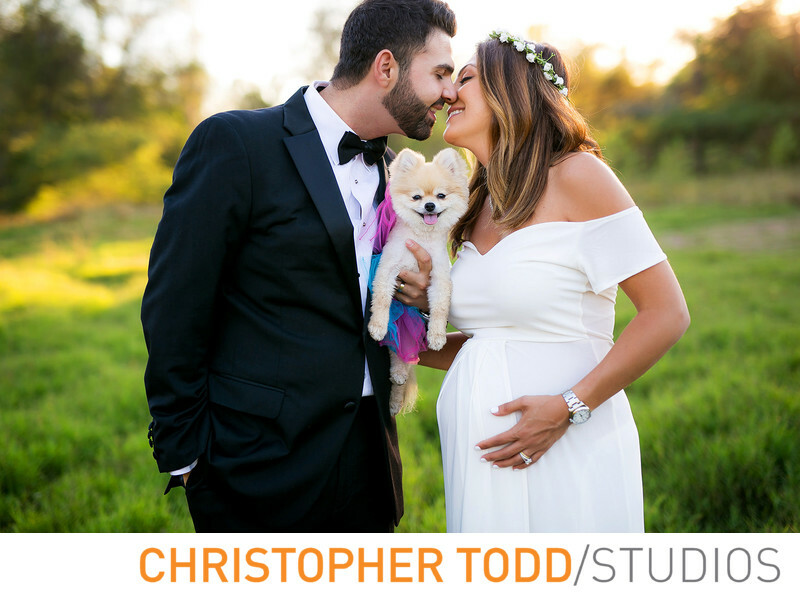 If you are looking for a photographer in the OC please be sure to check out Christopher Todd Studios. When we photograph couples during their maternity session we focus on the connection between the couple while creating beautiful photographs. We can help you decide on a location for your session. In addition to outdoor photos our professional photography studio is a great option. We are excited to take photos for you during this special time. Please contact us today with any questionsYou have. Email Or give us a call 949-771-9600. Location: 18000 Goldenwest St, Huntington Beach, CA 92648 . 1/320; f/1.8; ISO 100; 50.0 mm.